Beth may have just left town to return to her West Coast office in Seattle, but the rest of the Docservice team remains in Dallas. And good thing! There’s an exciting event around the corner that we’d like to invite you all to attend. Rue Magazine launched their first-ever Texas issue last week (it is gorgeous) and in addition to this awesome accomplishment, they’re also launching a Fall collaboration campaign with Gap called Styld.by. Ever heard of it? 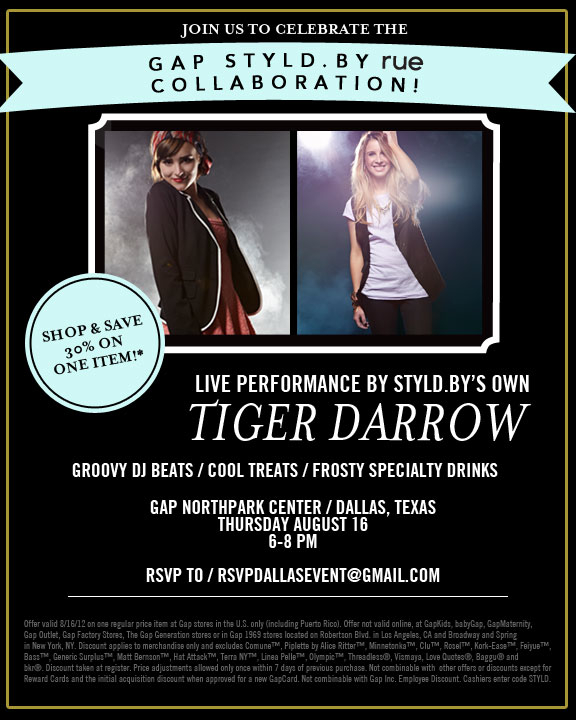 If you’re in Dallas, join Carolina and myself at the Gap store in Northpark Mall tomorrow, August 16th, between 6 & 8pm to celebrate their stylish collaboration. You may even recognize our recent Design Duel-er, Katie Anderson, as one of the Styld.by models!! (see above) This is an event for anyone that loves fashion of both the home and wardrobe… which includes us!! Hope to see you there. a new member joins the Docservice team! У нашей организации классный веб сайт про направление 1cs.com.ua.